The federal government may be closing down (or not), but the snow spigot is opening up over the Vail Valley on Saturday night, with forecasters calling for 5 to 10 inches of fresh snow on NFL Championship Sunday. Powder turns last weekend on Seldom in Vail’s Sun Down Bowl. Will we get a repeat this weekend? Football may keep the crowds away as weekend warriors flock to the slopes Saturday and then head back to beat the storm before Saturday night. Or there may just be so much pent-up powder aggression from one of the driest winters on record that folks stick around to mack up some soft turns Sunday morning. “Expect the next storm to bring snow to the southern mountains on Saturday, and then all mountains will see snow from Saturday night through Sunday. 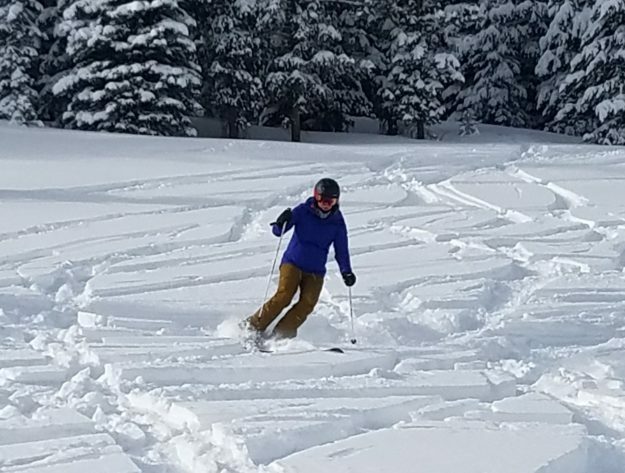 I still think Sunday will be the best powder day with 5-10 inch snow totals for most mountains, though there are nuances that are making this storm a tricky one to forecast,” Gratz wrote Friday. “Following the Sunday pow day, Monday should be dry, then we’ll see light snow Monday night into Tuesday, a stronger storm sometime between Wednesday night and Friday night, then another system around January 31st,” Gratz added. The forecast has inspired Vail Resorts to open some more terrain this coming weekend after the Back Bowls opened for business last weekend. See below for a full list of all the new runs available for snow riding on Saturday and Sunday at Vail and Beaver Creek. It’s also time to start catching some serious Olympic fever with less than three weeks to go until the opening ceremonies of the Pyeongchang Winter Games in South Korea starting Feb. 9. Two Vail Valley ski racers made the same podium for the first time ever on Friday as Lindsey Vonn and Mikaela Shiffrin finished 2-3 behind Sofia Goggia of Italy in a downhill at Cortina. That has to get people fired up to watch these Winter Games. But an even bigger story is that four-time Olympic medalist Julia Mancuso of Squaw Valley called it quits on Friday, retiring in favor of the NBC broadcast booth for next month’s Olympics. Mancuso spent a lot of time in the Vail Valley getting worked on by the Steadman Philippon Clinic, and she’s one of the best big-event ski racers in the history of the sport. Mancuso was just 21 when she was the surprise giant slalom winner at the 2006 Torino Winter Olympics, and she retires as the most flamboyant and decorated American Olympian ever in alpine skiing. Meanwhile, in local high school sports, Battle Mountain hosts its home Nordic meet Saturday at the Vail Nordic Center. The team is coming off wins in both the boy’s and girl’s classic races last weekend at Steamboat Springs. Saturday’s race in Vail will be a very quick skate race. VAIL, Colo. – Jan. 19, 2018 – With 8 inches of snow in the last seven days at both mountains and with snow in the forecast, Vail Mountain and Beaver Creek Resort will expand terrain. Beginning Saturday, January 20, Vail Mountain will open Earl’s Express (#38) and portions of Inner and Outer Mongolia Bowls. Beaver Creek Resort will open Elkhorn Lift (#14) on Saturday, January 20, and Grouse Mountain Express Lift (# 10) on Sunday, January 21. STATEWIDE — It may feel like spring today, but a blast of winter weather is headed our way this weekend. Don’t get caught off guard! Have your vehicle winter-ready. A strong statewide storm is expected to impact much of Colorado. Snow will begin falling Saturday morning over western Colorado and spread eastward across the state through Sunday. Motorists should plan on difficult travel conditions in the mountains Saturday through Sunday night and winter travel conditions will develop over the plains late Saturday night through Sunday. Colorado Department of Transportation (CDOT) crews are out today pre-treating roads and will be fully deployed throughout the weekend to treat and plow roads. Motorists are asked to stay behind the plows as that can often be safer than being in front of them. CDOT asks motorists to please not drive on the I-70 Mountain Corridor if you do not have tire tread that measures at least 1/8″, a four-wheel or all wheel drive vehicle, and/or chains or an alternative traction device (like an AutoSock). Motorists traveling on the corridor should expect longer drive times with the heaviest traffic going westbound Saturday and Sunday mornings, and eastbound Saturday and Sunday evenings. The National Weather Service predicts lighter snow for the I-70 corridor from the Utah Line to Vail Pass and heavier accumulations from four inches to a foot of snow from Vail Pass to Morrison beginning late Saturday morning. Motorists should also prepare for snowy conditions on roads in the Denver metro area with four to ten inches expected in the foothills beginning Saturday evening. Snow is expected to fall three to seven inches over the I-25 corridor beginning late Saturday to early Sunday. CDOT strongly urges motorists to take it slow when traveling to their destination. Keep a safe distance between you and the person in front of you. Please take a look at road conditions before you head up into the high country and use your best judgment. Worn tires can’t grip the road well and can be extremely hazardous. Check your tires by performing the Quarter Test. Insert a quarter into the tire tread upside down, with Washington’s head going in first; if the top of George’s head is covered by the tread, your tires are OK (do this test in multiple points around each tire). If the top of his head is visible at any point, you need new tires. Invest in safety by getting a set of snow tires. When it comes to stopping safely on snow and ice, all-season tires simply don’t compare to winter tires (see infographic). If your tires don’t have at least a one-eighth inch tread when a Traction Law is called, you are in violation of the law and could end up with a fine. In poor visibility, don’t drive faster than you can see ahead. High speeds in poor visibility can lead to dangerous chain reactions. Snow plows need space to work, so unless you want to cause a crash, delays or be stuck on a snow-covered road, don’t crowd the plow! Prepare a winter driving vehicle kit. Carry blankets, water, a flashlight, a shovel, some nutrition bars or other food for sustenance. Winterize your vehicle’s safety kit by including extra blankets, sand to help gain traction in the event you become stuck on ice or snow, jumper cables and an ice scraper. Additionally, all motorists should be familiar with Colorado’s Passenger Vehicle Traction Law and Passenger Vehicle Chain Law. These laws are implemented when weather and road conditions require it, at which time highway signage will be activated to alert drivers. Traction Law — When the Traction Law is in effect, motorists must have snow tires, tires with mud/snow (M/S) designation, or a four-wheel/all-wheel drive vehicle — all tires must have a minimum one-eighth inch tread. Passenger Vehicle Chain Law — Reserved for severe winter conditions as the final safety measure before an interstate is closed, the Passenger Vehicle Chain Law states that every vehicle on the roadway must have chains or an alternative traction device (like AutoSock). CDOT crews work hard to make sure the roads are safe for motorists to drive on. If there are spots that have no to limited visibility, CDOT will conduct a safety closure. CDOT will also implement a safety closure if it can be reasonably predicted that crashes or spinouts could occur due to the weather. CDOT will then concentrate on the closed areas to get them open as fast as possible. Travelers can see where plows have been and where they’re going by using CDOT’s plow tracking tool on www.cotrip.org/snowplow.htm#/snowplow.